Organize tabloid-size documents for quick reference with Ready Index Table of Contents Dividers for 11"x 17" binders. 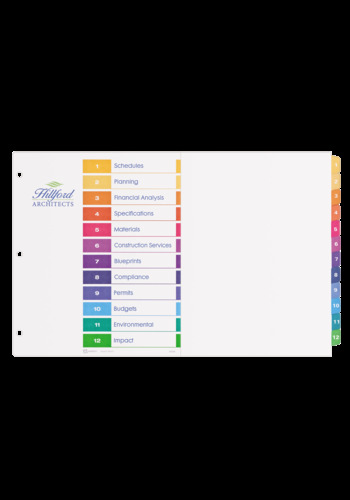 Ready Index Dividers make it quick and easy to locate important information. They include a pre-printed and numbered Table of Contents page along with 12 pre-printed numbered, multi-colour divider tabs and a table of contents page. Organize tabloid-size documents for quick reference with Ready Index Table of Contents Dividers for 11"x 17" binders. Ready Index Dividers make it quick and easy to locate important information. They include a pre-printed and numbered Table of Contents page along with 12 pre-printed numbered, multi-colour divider tabs and a table of contents page. Constructed with heavy weight paper and reinforced tabs, they provide extra durability and can stand up to prolonged use in binders.